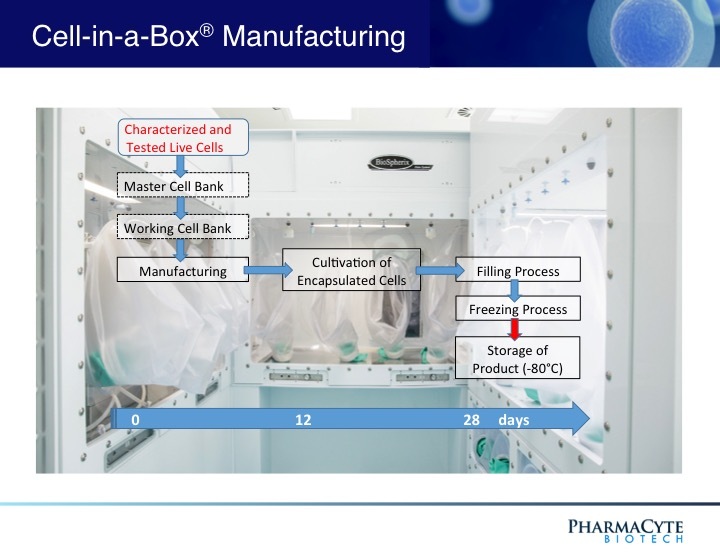 The Cell-in-a-Box® live cell encapsulation technology employed by PharmaCyte is a “platform” upon which treatments for different diseases may be built. This technology encloses live cells in protective “capsules” about the size of the head of a pin. The capsules are designed to allow blood to enter and nourish the living cells inside them. The live cells thrive while the capsules are in the body. But the capsules are also designed to protect the live cells from attack by the body’s immune system. The live cells are too large to escape from the capsules, and the body’s immune system cells are too large to enter the capsules and destroy them. PharmaCyte is using this technology to develop unique therapies for various forms of cancer and for Type 1 diabetes and insulin dependent Type 2 diabetes. The encapsulation of living cells using the Cell-in-a-Box® technology is a multi-step process. To be encapsulated, the live cells are first suspended in a medium that contains a proprietary polymer and sodium cellulose sulfate. This suspension is passed through a droplet-forming machine, and the resulting droplets fall into a solution containing another polymer. As the two polymers interact, immediately a membrane forms around each droplet. This develops into a shell around the droplet, resulting in a spherical capsule 0.7-0.8 mm in diameter. For pancreatic cancer, each capsule contains about 10,000 living cells. This number of live cells can differ depending upon the size of the cells encapsulated and for what purpose they are to be used. 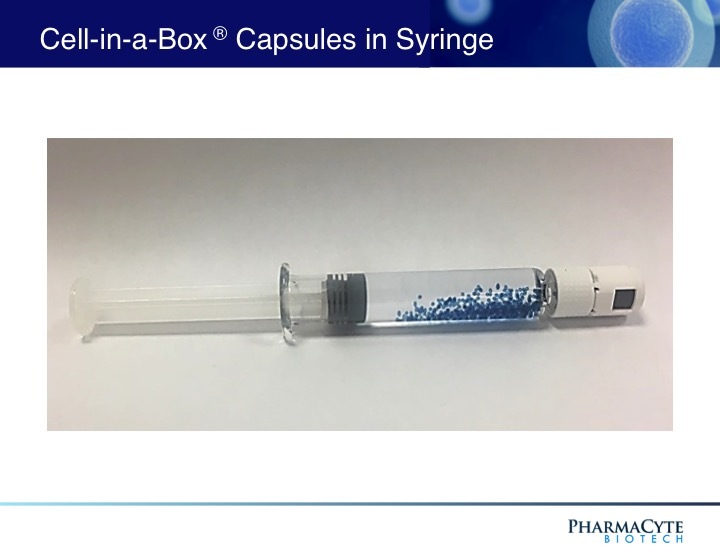 The Cell-in-a-Box® capsules have been shown to be safe, effective and durable in humans for approximately two years during two early clinical trials. The capsules are made of bio-inert material (cellulose/cotton). They have pores for nutrient and waste transfer. The pores are too small for the immune system cells to enter or the encapsulated live cells to leave. Also, the live encapsulated cells can be frozen and later thawed with viability of approximately 90% or more upon thawing. Hence, the frozen encapsulated cells have a long-term (5+ years) shelf life which results in manageable logistics. The capsules produced using the Cell-in-a-Box® encapsulation differ from those produced by others. Our competitors use substances such as alginate (a seaweed derivative) or chitosan, whereas our capsules are made principally of cellulose – a bio-inert material in the human body. The capsules durable, resilient and long-lasting. They can also withstand various external forces unlike those made using other encapsulation methods. The properties of our capsules allows them to be implanted in the human body by using needles or catheters without damage to the human body. Our capsules do not degrade, even after being present in the body for over two years. They do not cause any damage to or inflammation of tissues where they are located in the body. Cells encapsulated using the Cell-in-a-Box® technology can be stored frozen at -80°C or lower for long periods of time and then successfully thawed – a necessity for shipment to distant locations. 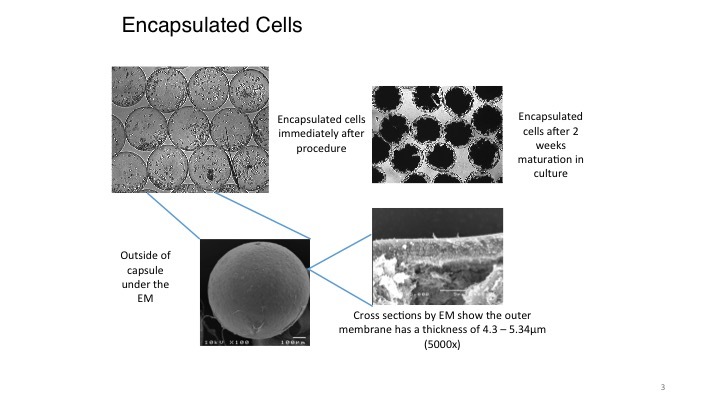 Large-scale manufacturing of encapsulated cells using this technology has been carried out according to current Good Manufacturing Practice (cGMP) conditions – a necessity for ultimately attaining marketing approval from drug regulatory authorities. PharmaCyte has acquired the worldwide exclusive rights to this live-cell encapsulation technology for the development of treatments for all types of cancer using a certain type of cell line, for the treatment of diabetes and for the treatment of diseases and their symptoms using constituents from the Cannabis plant. The rights to use the cancer prodrug-activating cells that will be part of PharmaCyte’s therapies for advanced pancreatic cancer and breast cancer were also acquired. PharmaCyte’s partner, Austrianova, has constructed and equipped a cGMP-compliant facility in the Thai Science Park in Bangkok, Thailand. 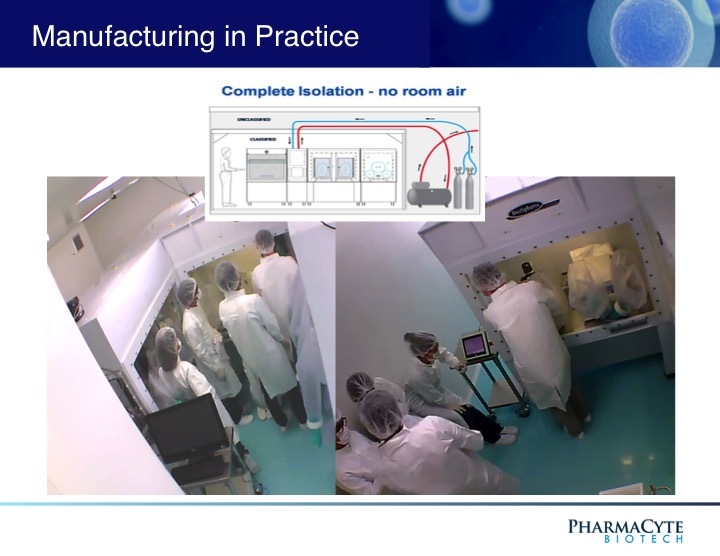 The facility will be used to encapsulate the live cells using the Cell-in-a-Box® technology. We will use the encapsulated live cells for our clinical trials discussed in other sections of this website.